I have pondered a long time getting a HTPC type of device connected to Full HD screen. It has taken me so long, because of the long list of requirements that I have. First of all the device should not consume much electricity in idle state or even when used still keeping in mind that it should also have a decent performance. While the device should be able to decode 1080p content it still needs to be quiet, so it would not disturb the user experience while listening music, watching a video clips or photos. There is also connectivity requirements such as HDMI and WLAN, and still it should be small device. While searching a device I first came across the Intel Atom based nettops and boards. However because I like to have challenges in my life I wanted to select something more "exotic" for the base of my device. So, I continued my search and finally found the Pandaboard, a very small ARM based board manufactured by TI. I got the device in a small black box a printed pandaboard image on top of it, which contained only the board in antistatic bag and some padding. 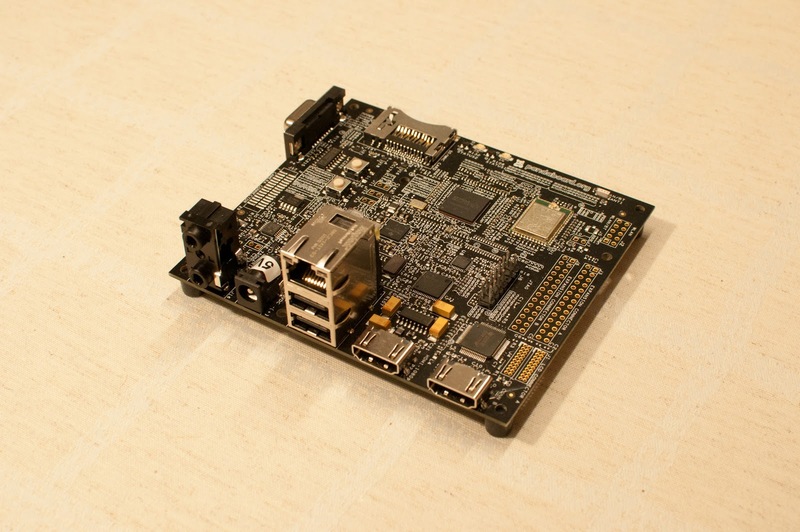 The board itself is in my opinion a very nice piece of hardware in very compact space. Pandaboard has very nice features including for example 1080p decoding, HDMI, WLAN, BT, and two USB 2.0 ports. In addition to the Pandaboard itself one needs to get also a power supply, SD memory card, HDMI cable and wireless keyboard/mouse or other controller for the device to get started. I am looking forward of seeing how this will work out. I am my self dreaming of similar setup maybe with XBMC. I was wondering how it is going with this experiment. Did you managed to get it working? I was searching for the same thing like you. Really thank you for your information. I has been in a bit of a stop lately. I have all the hardware but had compatibility problems with LG 42LG6100 and Sony 37EX500 TV's that I was aiming to use this with. I'm planing to start up again and try if anything has changed. I also tried the MeeGo but because lack of the 3D drivers I didn't continue that much further, however now the drivers are also available so I might try out that as well. I'll post entries later when I get things running again. Hi, Sylvia. The picture was taken by me and you can use it, however I would appreciate if you would mention me (/my blog) as author.